Arshinder was born and raised in Patiala, a small town in Punjab, India. He graduated from Law School at Punjabi University, Patiala in 1999. After graduating Arshinder practiced law at the District and Sessions Court, Patiala. From 2002 to 2003 he worked as Senior Legal Assistant for Punjab State Human Rights Commission. In 2009 Arshinder immigrated to Canada with his wife and daughter. 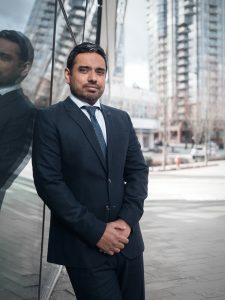 Arshinder was called to the bar in July, 2015, after completing articles at Cowley and Company. He has appeared before the Supreme Court and Provincial Court. His trial experience has enabled him to evaluate each client’s claim and obtain optimal results. When not working, Arshinder loves being with his family and following sport, particularly soccer and cricket. He is a lifelong fan of Manchester United and the Indian Cricket Team.